A diet is simply the choice of foods a person decides to consume as part of their nutrition. Diets can vary depending on the person, circumstance, culture and nutritional need. A person’s diet can have an impact on their health and life longevity, with certain religions and cultural diets restricting the consumption of certain types of food e.g. Buddhists and Hindus are mainly vegetarians whilst Islam and Judaism restrict their followers from eating pork. A major emphasis in recent decades has been on ‘healthy diets’ which have been promoted to help people to either lose weight and lead healthier lifestyles or to help those already in good shape get to an even better level of health and well-being. For this reason, it can often be difficult to put together an appropriate eating/diet plan especially in regards to amateur athletes as there are so many different foods available for consumption. An athlete who requires a balanced diet to remain or build themselves to peak physical health needs to understand the options available to them and what foods can benefit of hinder their progress. Below we have provided a detailed guide as to the elements which should be considered when looking to build an effective diet plan as an athlete or keen fitness person. This is the first and most important step when looking to build an effective diet plan, you should think about the goal: “What do I want to achieve with this diet plan?”. It is important that you understand and clarify this issue in advance, because it makes a difference in whether you need more carbohydrates from calorie dense foods due to high exertion from your particular sport or whether a diet rich in protein is required to help build muscle mass. 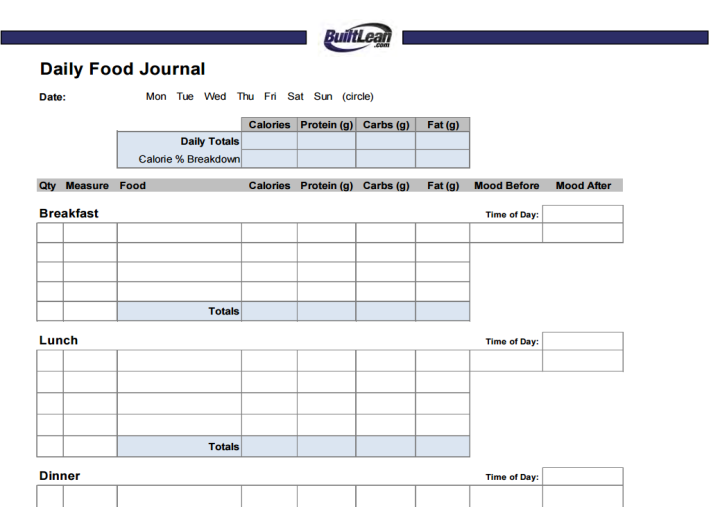 Knowing the desired objective, before creating a eating plan is the first rule. In the second step, the present condition (or state of the body) needs to be recorded and detailed. The questions need to be asked “What do I eat now?”, “When and how many calories do I consume daily?”, “How much do I currently weight?” To answer these questions, it may be helpful to use a diet protocol. If it may prove to be a hassle filling out the paper daily, then there are also various apps available on smartphones and computers that allow users to enter every meal they eat and automatically calculate how many calories are consumed each day, alongside all other nutrient intake. Now that you know what goal you want to achieve through your diet and what your current diet is, the next step is to define how you can actually achieve your goal. To determine this, it will help you first of all to determine what your caloric needs are. The daily calorie requirement is composed of the basal metabolic rate (BMR), calories burned during sporting activity, physical activity level (PAL), energy used during digestion and diet-induced thermogenesis of nutrients. The below calculator can be used to get a near accurate indication of what your daily calorie requirement is. If the goal is to build muscle mass, then a slightly higher calorie balance is needed. To build this mass safely, it is better to stay within the safety margins of 300 – 500 kcal amount (or approximately 10% of total calories). More calories can be disadvantageous, since the increase of body fat is more likely at that point. Similarly, if you are looking to reduce weight, from the determined energy expenditure, 300 – 500 less kcal should be consumed. A higher calorie deficit will equal to even more reduced body weight; however, you risk the chance of fat increasing rather than muscle mass. A 26-year-old with an office job (PAL-value = 1.4) having a body weight of 75 kg and works out four times a week, for one hour each time in the hope of building muscle mass. On training days, the caloric needs for the man (A + B + C + D + E + F =) is 3846 kcal, and on non-training days (A + B + D + E + F =) 3321 kcal. It is clear that the man will need a very high calorie diet to provide the energy that is required to supplement his desire for increased muscle mass. So in this case, what macronutrients are required to build muscle mass safely at such a high caloric intake? The maximum amounts of the daily recommended macronutrients can be determined via the established energy demand (3846 kcal). It is now clear how much energy per day is required and at what amounts it should be consumed in the form of macronutrients. But how do you practically implement this?, what foods are actually available? The choice of food should be balanced with adequate care taking for the nutrional values the food hold as well as the individual needs. Basically nothing is really forbidden, but certain foods should only be eaten occasionally especially when it comes to sports professionals. As sources of carbohydrates, you should look to consume complex, low glycemic foods. They allow you to be full for longer and also provide important dietary fiber and micronutrients. The protein sources should have a high biological value (BV) possess and contain little fat. Fats from vegetables origin are usually more healthy and beneficial compared to animal or processed fats as they contain unsaturated or essential fatty acids. Meals – how many and when? How many meals per day is then required to ensure all the nutrients in the foods are utilised properly. Depending on the kind of athlete, meal times and schedules vary although most sporting professionals have five to six meals at intervals of two to three hours are ideal each day. There should be an equal weighting of proteins uniformly for each meal. Breakfast should not be ignored or skipped and should be low in fat and the last meal of the day should contain only a moderate amount of carbs. In the modified version of this distribution with six meals, dinner can be reduced to 15% with an extra meal eaten just before bedtime (remaining 10%). For those who find it difficult to build muscle mass (hard gainers) this meal can be carbohydrate-rich. All others should moderate the amount of carbohydrates and have a mixture of protein and low-fat foods. Now that we’ve work out how much energy is required, what the food group weightings are and how many meals are necessary to achieve the desired objective. It is then time to plan out the actual meals. There are many apps and online plans that provide a preset plan of food based on your nutritional needs. You now know how the diet plan can be created and can apply it. There still however bears the question: how do you check if your planning is bearing fruit?. There are various monitoring methods available which can provide important information as to whether the diet plan created can be maintained or perhaps needs to be changed. An important tool for monitoring the success of your diet plan is the body weight scale. A weekly weigh-in can provide information on how much weight you’ve either lost or put on during the week. Here, the weighing should always be under the same conditions are performed (e.g. time of day, after lunch or diner etc) The documented weight trend can also be displayed graphically, if necessary (line chart, etc.). Depending on the original target objective, results can vary. Weight gain is often dynamic and subject to the individual variations, therefore it is advisable to check the progress. If weekly weight has increased by more than 300-500 g, it is likely (in spite of sport) to be an increase in fat storage, which is less advantageous for athletes. In this case, the total calories should be reduced by about 10% whilst maintain the nutrient ratios. However if the individual’s weight remains constant, then there should be an increase or decrease dependant on the individual’s needs. If the goal is weight loss, then the above recommendations are reversed: a weekly weight loss of 300-500 g in accordance with the recommended acceptance. If more weight is lost, then it is likely to be a decrease in muscle mass instead. As a further option to measuring progress, weekly photos can be taken. They should be taken always from the same angle and time. Naming the individual image positions and noting the date is best. Thus, the variations can be better visualized and progress can be actualised. These three monitoring methods are not only to control but to motivate the user. After all, everyone likes to see that the desired goal is getting closer.